Don't we all wish we have a compartmentalised water container that we can keep our brushes (in water) in one place and the dipping water free of them? Well, I have come up with this piece which I find pretty useful. And I am going to teach you how to make it. It does not require extensive knowledge nor cost a lot. I think where ever you are, chances are that you can find the materials - a used detergent container (pictured left) and the finished product at left. 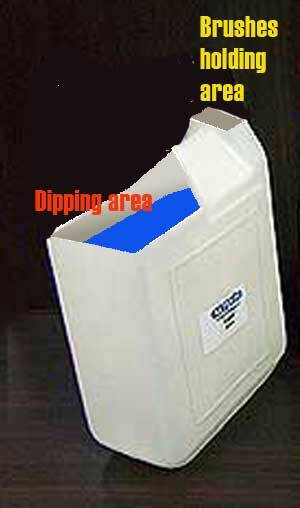 Get a plastic container as shown. Cut the tops off in two areas. First cut the 'handle' area at the back which will serve as a brush holding area. The cut out the bigger front section for you to dip your brushes, and you will have an organiser-water container. See the picture at right. Note that the brushes will be dipped in the same pool of water and some of you may not like it. I feel that brushes kept in water helps to keep the hairs soft and supple. 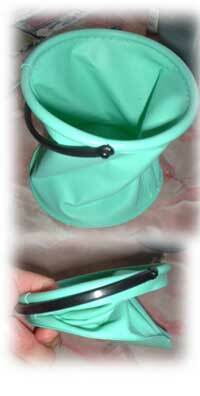 This simple contraption is not only cheap but hardy and functional as well. Hope you will find it as useful as I have. One of the biggest problems - if you can see it as such - facing outdoor watercolourists is the use of water containers. Unlike painting in the comforts of a studio, you have to equip yourself with more things and carrying them can be quite a task. When the bug bites me and I itch to go outdoors to paint, I usually bring along as few things as I can. The journey is made light and easy. My pack includes one paintaing case, a foldable chair and a mini beach umbrella. The painting case, as you can see in the picture (Top: showing the inside of the case; Bottom: the cover which is an easel itself). Within its small confines, I stuff my towel, a foldable water container, my brush, clotch pencil (fatter version of the mechanical pencil), putty eraser and painting palette containing paint, and small sized papers that I can squeeze into the case. And if I need to do bigger paintings, I will capture the scenery of the moment using my digital camera which I can easily download and use it as reference material later. What is your outdoor arsenal? This is a close-up study of two fishing boats in Port Dickson's fishermen's wharf. The fan-like machinery are the motors used to reel in their nets at sea. Without this mechanism, there is no way fishermen can reel in nets which are close to a mile long, and laden with fish, at sea. 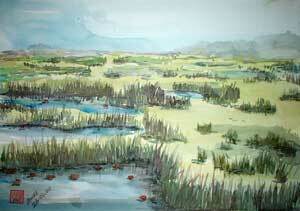 This is a simplistic piece, drawn very relaxed with subtle colours, to capture a typical Malaysian wetland. 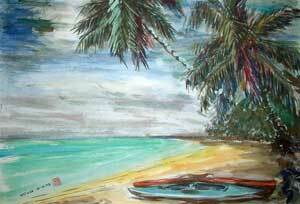 This is also among my earliest paintings, done in 2003. This is a depiction of my childhood memories. Hyacinths, duckweeds and water lettuce. These are part of the flora kingdom I grew up with. Ponds such as this house a wide variety of fish, including the Malaysian fighting fish. I remember the days when I would frequent such places after school hours, armed with a net, to catch fighting fish. Ponds such as this are also where I hang out during school holidays with friends, fishing for perch and gouramies. This was painted in 2003. 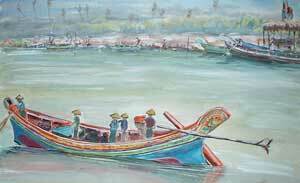 This is a depiction of Kelantanese fishermen returning from sea. Not very well captured but this is one of my earliest pieces. It was painted in mid 2003. 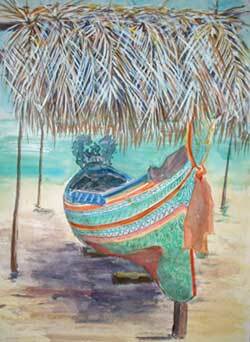 A pair of canoes rests under the palm trees. This is a scene in Teluk Kemang, Port Dickson, in Negri Sembilan. This stretch of beach is deserted on weekdays and watersport operators take a break in the lull in business. These two canoes are among the things you might find here, apart from jetski rentals and diving equipment. This piece was painted in Oct 2003. This is a painting of a rowboat I painted at the Lake Titiwangsa in Kuala Lumpur. I was trying to capture the shallow weed beds under the boats and did not do too well I suppose. It was painted in Aug 2004. Colourful patterns. 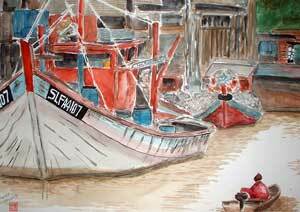 This is the beauty of the traditional fishing boats of Kelantanese fishermen. As can be seen, this one is sheltered from the elements under dried palm fronds. The boat is propped up and kept away from dampness. The intricate patterns are painted by hand and fishermen in Kelantan take great pride in their handiwork. This piece was painted in late 2003. I had to record this - the Boxing Day Tsunami which caused devastation throughout Asia, taking with it hundreds of thousands of lives. This painting was based on a photograph of the aftermath. The waves were dying down and the specks on the high banks at left are the people who came out to witness the tragedy. I remember coming home from work that evening and , dazed by the swift tragedy which hit part of my country and destroyed lives, I started working on the painting which I cimpleted just under two hours that night. It was something I could not forget and hope by sharing this with you, we can remember how unforgiving nature can be. This was painted on Dec 27 2004. This is another of my line and wash technique which I again failed to capture well. The rough surf too was quite tough to achieve and I think I failed in both miserably. However, I think I managed to get the skies right, setting the mood for an impending storm. 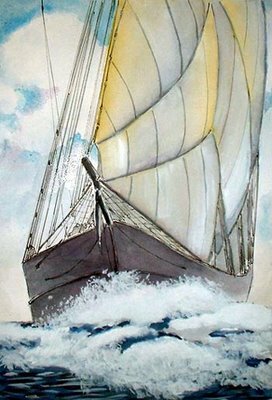 Perhaps I should not have introduced the lines on both the sails. What do you think? This was done in February 2005. This was done taken from a photograph of a sailboat at lowtide. I was experimenting with my new Rotring pen in this maiden attempt of line and wash. This is one of the hardest technique to master and as you can see, I am not able to control the medium just yet. 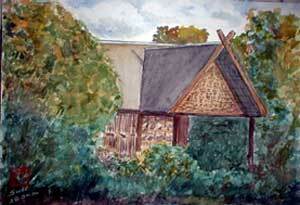 This was painted in May 2005. 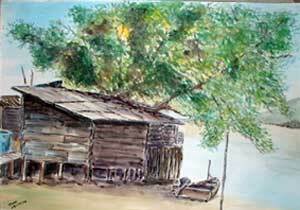 This is a makeshift house by the Sepang Rivermouth in Bagan Lalang. The house is made of planks and discarded zinc sheets salvaged from construction sites. This is a poor fisherman's abode, his castle of sort. It is in this rickety structure that his life and that of his family revolves as they hope for a better tomorrow. I am not wise with words but I have lived in such a house before. If you observe carefully, the house was built under a tree. This may seem foolish but I think when the owner built this house, he planted the tree - a sea almond tree. Most fishermen mark the time they stay in a certain spot by using this simple method. Judging from the size of the tree, the house must have been there for more than five years. This piece was done in Oct 2004. 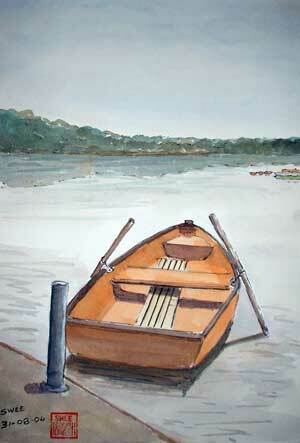 This piece represents a departure from my usual work of boats. I was trying to experiment with simple strokes in this piece which features two dying pine trees by the beach in Morib. 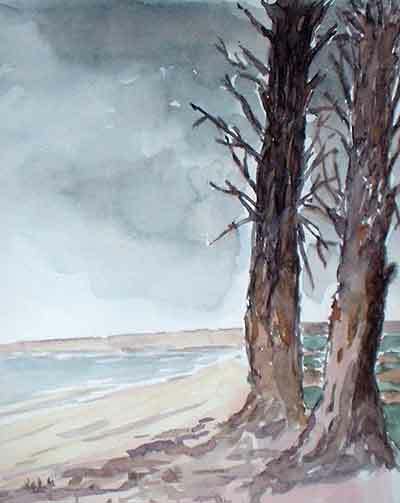 The surrounding scenery has been simplified as I try to capture the mood of the impending storm and the trees. 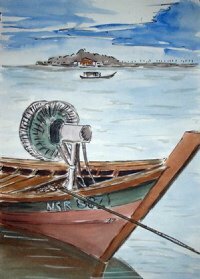 This is a piece I did when holidaying in Bagan Lalang, a rivermouth fishing village in Selangor. 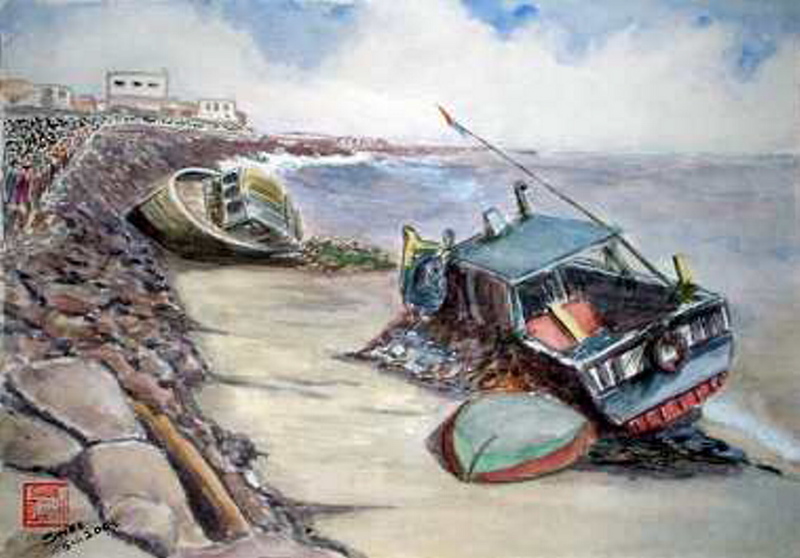 Because of the shallow seafront, fishermen here do not use big fishing boats but rather small ones for inshore fishing. The reddish blob is the fishing net or pukat which fishermen lay across the seas, parallel to the shore, to catch any fish coming to feed close to the shore. Most of these small boats are made of fiberglass and motorised. 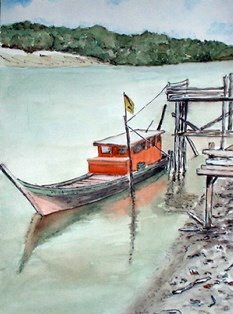 This is a picture of a fishing boat drawn in Port Dickson, near the fishermen's wharf in town. The fan-like structure in front is the motorised wheel used for dragging in the fishing net. As you can see, the numbers in front of the boat starts with NSR. In Malaysia, boats carry registration numbers according to the states, such as the prefix N for Negri Sembilan, S (ie. SLFA) for Selangor and so on. 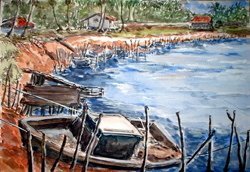 This was done in Sungai Besar, a small fishing village in the State of Selangor. In the foreground is a fishing boat awaiting for the tide to come in. The spikes you see along both sides of the picture are mooring posts for the fishing boats. Although protected from the elements, these mooring posts keep the boats in place. The houses are built on stilt and have zinc roofs. During the rain, it can be quite noisy in the house. This was done in Sept 2004. If you have been to Malacca, near the Maritime Museum, you would have seen this. The house in the background is an old godown where charcoal and mangrove logs are stored upon their arrival from Indonesia. The modern boat rests beside an old fishing boat by the jetty. 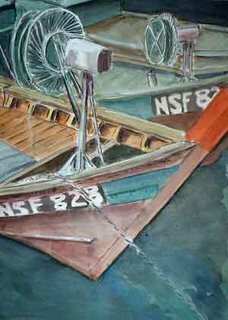 What I was trying to capture is the play of light and shadows on the hull of the white boat. This was one of the earliest pieces which I did. As you can see, it is very amateurish. 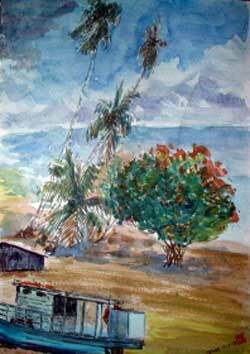 It was done in March 2004, months after having picked up watercolour again. The scenery was taken from a photograph sent by a friend who lived overseas. 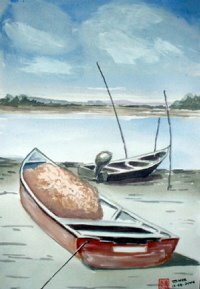 Welcome to my watercolour blog. 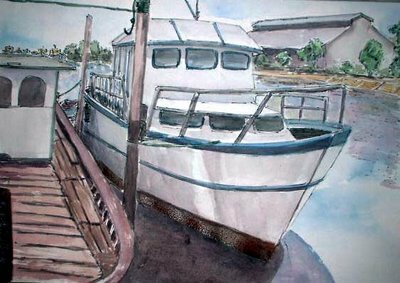 This is my online journal to document my progress as a watercolourist. 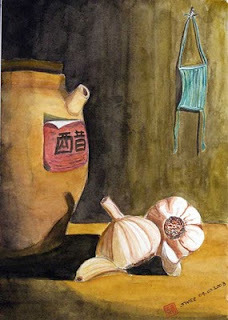 I did not undergo any formal education in watercolour so I think I can consider myself largely self-taught. 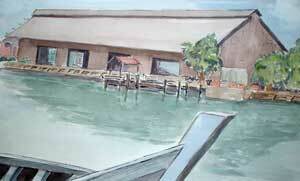 And yes, I am an amateur, having a fulltime job elsewhere and doing watercolour as a serious escapade. It is more of a hobby and for the love of this medium. I took up watercolour painting three years ago after having abandoned it for over 25 years. 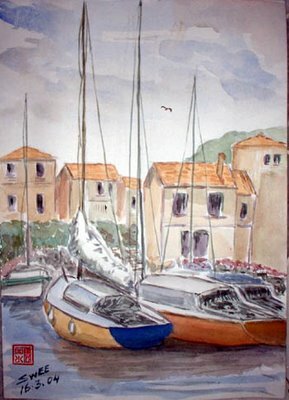 Within this site are all my watercolour paintings since 2003. 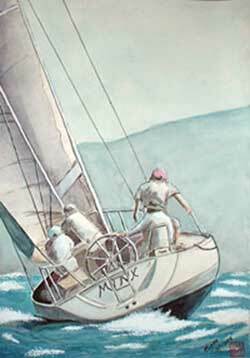 I loved painting and drawing from as young as I can recall. 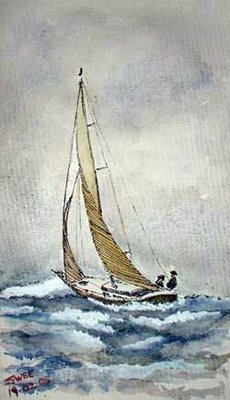 And I have painted quite seriously since I was a teen but back then, art is not exactly something you can earn a living from. I suppose it is the same all over the world; life as an artists in the 70s is not exactly an enviable career choice. And when I came to the crossroad of my life back then, of having to decide on what career I would eventually want, I decided to keep art out of the way for practical reasons. One evening, on a bridge over a swift flowing river, I took my painting set (palette, colours and brushes) and set them on a journey down river. I said back then, I remember vividly, that should our paths cross again, then I would pick up my brush again. And in 2003, our paths did meet again. A chance meeting with master artist Tang Tuck Kan at the Petronas Art Gallery sparked my interest watercolour again, and a year long tutorship under this wonderful man in one of the many Petronas ClassArt programmes brought me back to watercolours again. 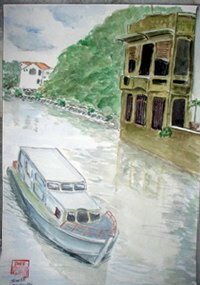 As I painted, I have the good fortune of meeting personally wonderful watercolourists of Malaysia, such as the famous Chang Fee Ming, Chow Chin Chuan, Calvin Chua, Dr Wong Seng Tong, Maamor Jantan (whom I have also had the good fortune to receive a three-month instruction), Rafiee Abdul Rahman and many others. The fact that some of them are self-taught inspired me to continue, albeit my skills are at the disadvantage of the time past but still something that can be acquired with the quantum leap technology that the artistic medium has undertaken. I only use one brush to paint - a large Chinese wolf hair brush, a method imparted by my first mentor. 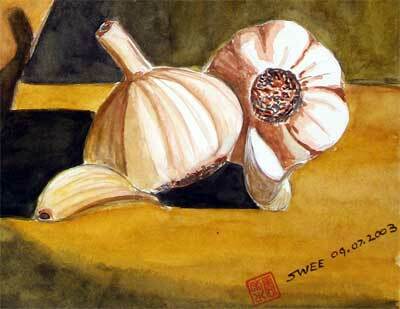 I use a wide range of watercolours, with no fondness for any particular brand. 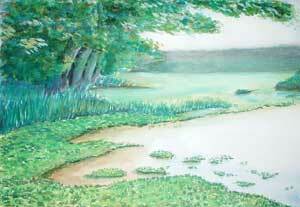 I have also started using thicker acid-free paper because of the ease with which I can exploit the water medium. 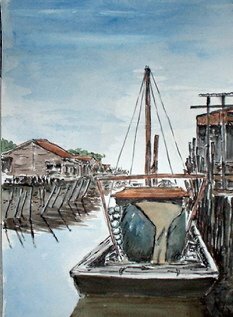 I usually paint boats and fishing villages in Malaysia. These are the subjects that are near and dear to me, for I have grown up with them and which I know pretty well. 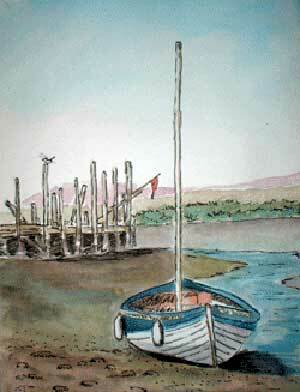 My other subject is water, which I feel is most difficult to depict, especially in watercolour. 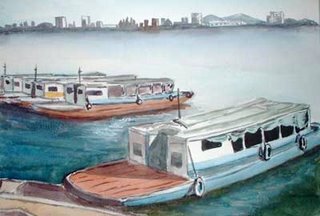 Recently, I have begun experimenting painting man-made structures such as buildings which I find to be quite a challenge because unlike boats, they come in many forms. 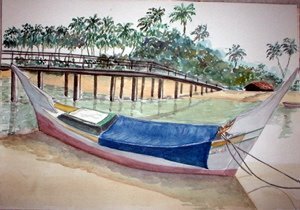 I hope to be able to meet more Malaysian watercolourists, especially the amateur ones since we are in the same boat (no pun intended), to learn from each other and share our knowldge in this very fluid medium.